The vast bureaucracies of the US government command a budget of about $4 trillion. Most foreign affairs activities are captured in budget line 150 – and amount to about $50 billion annually. Media reports, leaks and off-the-record briefings from President Donald Trump’s administration suggest the new leadership is looking for savings of 37 percent from line 150, to be redirected to defence. Within that goal, the administration wants to cut spending through the UN by half, although it may be phased over a period of three years, according to Foreign Policy. Experts and retired military officers have appealed for the government to reconsider, in the national interest, and analysts say Congress may yet trim the scale of these hypothetical cuts. In any case, broadly speaking, how much does the US really spend on international relations, aid and multilateral affairs, and where might the axe fall? IRIN recognises the complexity of US and UN budgeting and welcomes feedback or corrections. An annual report to Congress by the State Department summarises US spending on all international organisations. Its report for the last financial year, 2016, records $10.4 billion as the total expenditure. UN-related programmes, funds and agencies account for 84 percent, according to a review by IRIN. 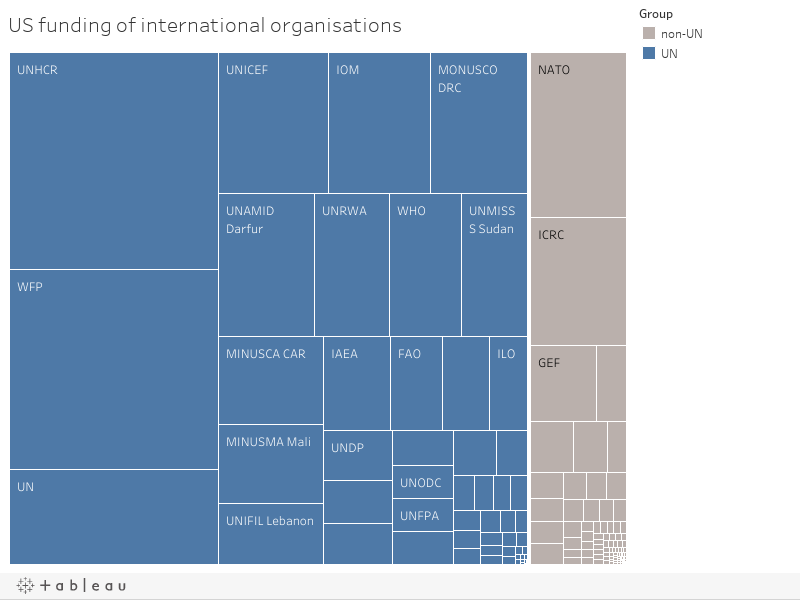 Others among the more than 150 grantees are other multilateral bodies such as NATO. Among the smaller items are a conservation body for the Atlantic tuna, and a handsome $6,000 for the Caribbean Postal Union. US contributions to the World Bank, IMF and other multilateral finance bodies are reviewed in a different annual report to Congress. 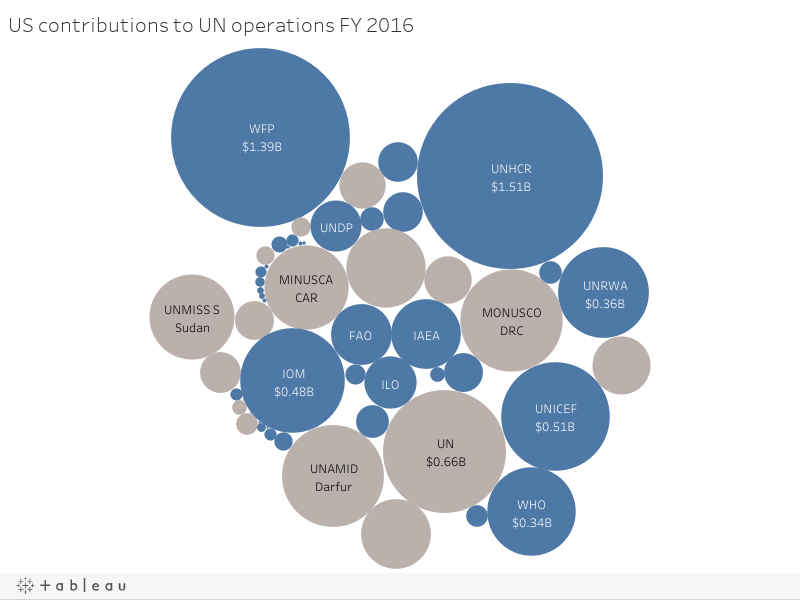 The UN spending accounts for about $8.8 billion, according to IRIN’s review of the 2016 listing – more significant perhaps as political ammunition than in cash terms, given the size of the overall budget. Therefore a 50 percent cut would have to find over $4 billion. This UN spending can be divided into two main categories: assessed and voluntary. Assessed funding is obligatory on the member state, and each nation pays a share proportionate to their economy; the US pays the largest share. Its share of the core UN budget is 22 percent, and its share of any UN peacekeeping action is even higher, at 28 percent. This means that once a peacekeeping budget is approved by the collective UN members, the US picks up the bill for 28 percent, for the duration of the mission. Member states can, and often do, fall into arrears on assessed funding, and the UN discreetly attempts to chase up payments from defaulters, while full details are not made public. The UN was owed $3.7 billion by its members, as of mid-2016. Chronic non-payment can lead to a suspension of voting rights. However, the US has been severely behind on its dues to the UN in the past without suffering the sanction of voting limitations. The first option can’t be pursued unilaterally and the third is a long way off as it is a long-standing formula regarded as blunt but fair. "WFP and UNHCR are the biggest and the most vulnerable"
To achieve short-term cuts, our analysis is that US officials will have to look at the voluntary portion. This is where most emergency and humanitarian spending falls: The big three of the World Food Programme, UNHCR (the UN’s refugee agency) and UNICEF (the children’s fund) together total $3.4 billion and significant savings cannot be made without reducing their budgets. Complicating matters is the long-standing convention that American citizens run WFP and UNICEF. Both positions are up for replacement. The US has proposed former South Carolina governor David Beasley to run WFP, while Tony Lake, an appointee of former President Barack Obama, sits atop UNICEF but is due to step down. A former USAID official said this week, “if US guts funding, we shouldn't get to appoint the chief. Period.” As IRIN reported in November, WFP and UNHCR depend on the US for about 40 percent of their budgets and therefore, in some respects, are both the biggest and the most vulnerable aid operations today. *Clarification: Membership in UN-affiliated agencies, funds and programmes also incurs assessed costs, but at much smaller amounts than membership of the overall UN. So how would you find 50 percent cuts in overall spending? Mathematically, almost 80 percent of voluntary funding would have to go, assuming that reducing assessed spending would take longer to adjust. Trump’s cuts may meet with widespread popular support, and galvanise savings and more efficient behaviour from the UN, but the amounts are miniscule in the wider scale of US spending, say critics. Also 2017 is a tough year to slash emergency aid budgets. The two UN agencies looking down the barrel of the US cuts, for all their weaknesses, have a lot of responsibilities that UN member states cannot handle alone: Some 70 million people may need food aid this year, according to US-funded watchdog FEWSNET, while refugee and displacement numbers remain high at 65 million. Note: Dark blue indicates mainly voluntary funding, grey shows mainly assessed.